I’m using iPhoto and my hard drive is full, even after moving non-essentials to an external hard drive. I’m volunteering on a community project, and the photos I have stored in iPhoto are essential, though they are scattered by date. I want to split my iPhoto library and move non-essential photos to the external hard drive, and then recombine them when I get a new Mac. With over 12,000 photos, I don’t have time to separate photo by photo, but could do so by year and move back the few individual photos needed. How can I divide the library quickly, while maintaining all the components and a link to the app so I can navigate to the part I need? You have two tasks to perform. The first is to organize your photos by year and the second is to then copy those photos to a new library and delete them from the original library. To organize your photos by year in iPhoto, choose File -> New Smart Album, and in the resulting sheet, create a condition that reads “Date is in the range 1/1/xxxx to 12/31/xxxx (where xxxx is the year you want to sort by). Give the album an intuitive name along the lines of 2005. All the images from that year will now appear as part of that smart album. Now tool on over to Fat Cat Software and pungle up $20 for the most excellent iPhoto Library Manager. This utility makes it easy to create multiple iPhoto library and copy content between them. In iPhoto Library Manager click the New Library button to create a new library—call it something like Pictures from 2005. Save that library to your external hard drive. Select the library you’re currently using from the iPhoto Libraries list and locate the smart album you just created (the one we called 2005). It will appear in the list of albums for that library. Drag that 2005 library to the new library you just created. iPhoto Library Manager will copy the images to the new library along with their tags, keywords, and metadata. Once the images have been copied, select your original iPhoto library in iPhoto Library Manager’s iPhoto Libraries list and click the Relaunch iPhoto button. 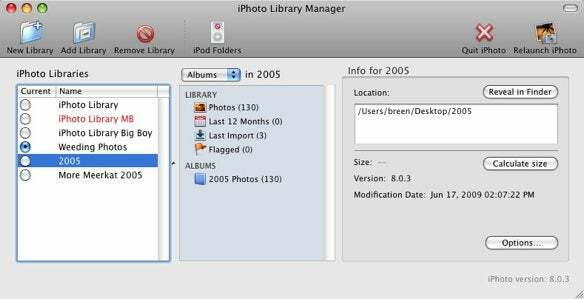 When iPhoto launches, it will contain the contents of your original iPhoto library. Select the smart folder you created (2005, in our example), press Command-A to select all the images in it, hold down the Option key, and choose Photos -> Move to Trash. And that’s exactly what will happen. The selected images will be moved to the Trash. To delete them from that library for good and all, Control-click on the Trash entry in iPhoto’s Library pane, and choose Empty Trash. When you get that new Mac, just work backwards. Use iPhoto Library Manager to open the library that contains your archived images, and copy them to the new Mac’s iPhoto library.